This is just a place for me to throw up some pics and whinge about my mistakes etc. 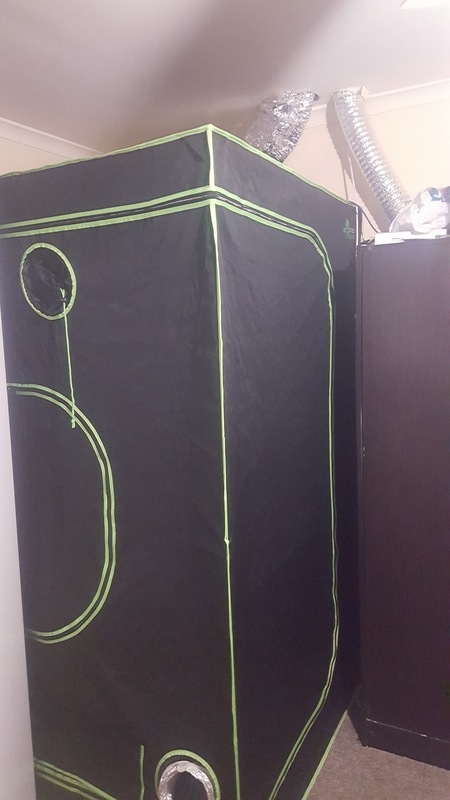 My system is a 4x4 tent with a 3' flood and drain tray with 160L a reservoir. 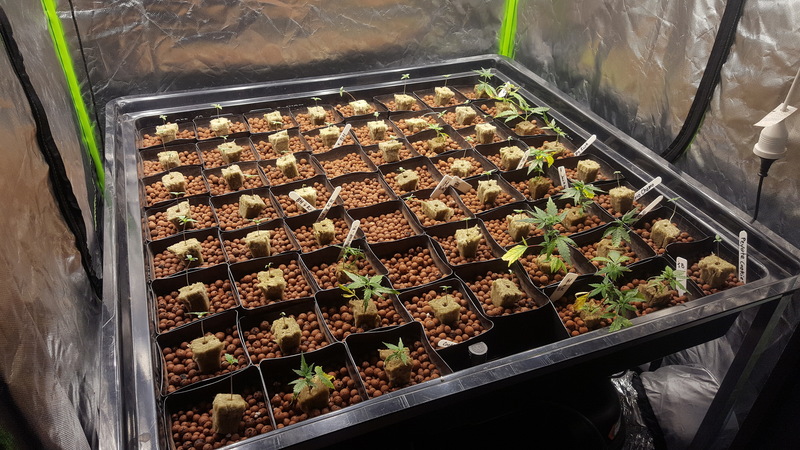 I don't run any fancy nutrients just a 1 part cheap veg at the start and a 1 part bloom nutrient. 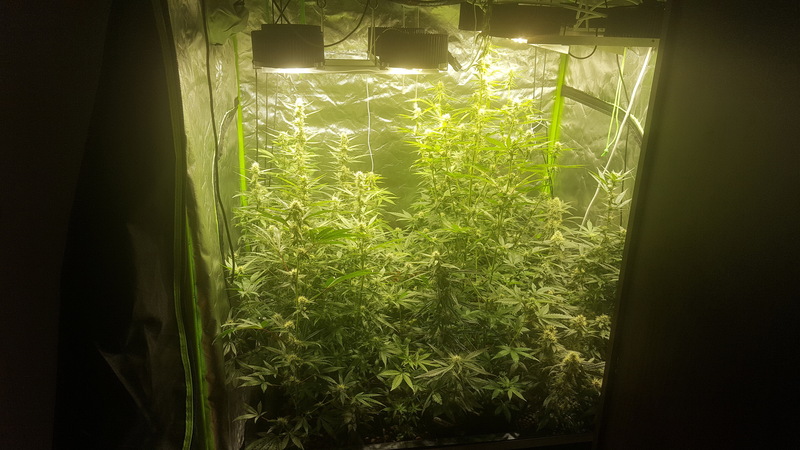 The LED's are 8 x CXB3590's for a total of 600w, they are too close together and not spaced accordingly for the size of the tent but they are holding their own for now until I reconfigure at the end of this first run in this setup. I run my PH from 5.5 sometimes a smidge less when I stuff up and let it rise to about 5.8-6.0 when I refill the res. 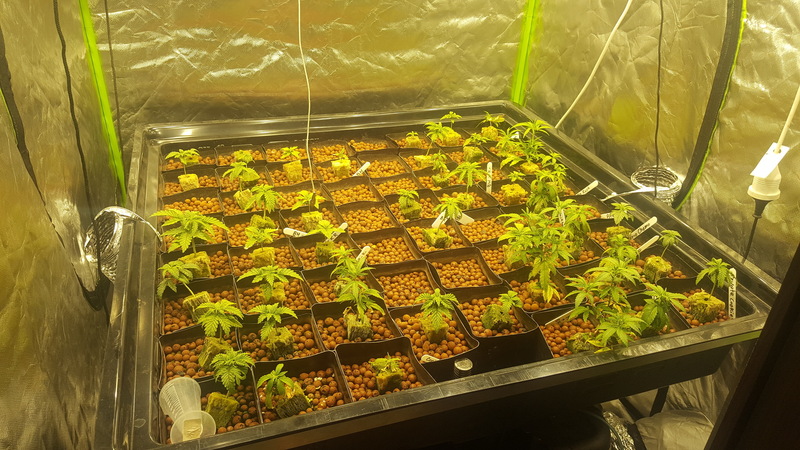 the res only gets refilled about weekly (about 70/90 Litres) and some H2O2 is added, I have switched from veg nutes to bloom nutes without ever emptying or changing out the res and it will not be changed out completely for the whole grow.. just topped up. 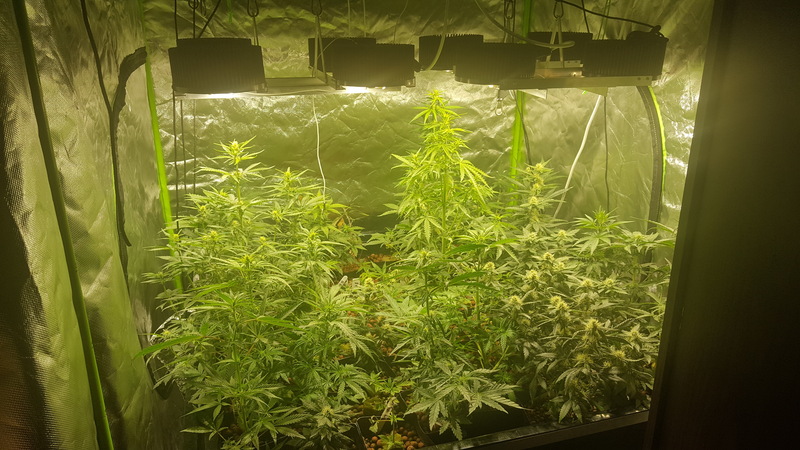 The plants are crammed in at just under 4 per square foot and is messy as hell. Feel free to tell me your opinion good or bad and over the next few posts I will whinge about my stupid stuff ups. is it coco flood and drain? sounds like a nice setup. i like the convenience of it, the thought of having to change it out fully every week or 2 is why i've been hesitant about keeping a res but you sound like you've got it figured out! Stuff up number 4 was when I had finally got the clones to fill the gaps 10 days later.... well it was a repeat of mistake number one... not far enough down to wet the rockwool cubes enough so 90% of them died..
Alrighty so stuff up number five it was at about this time in the grow where I went to refill my 1 litre bloom nute container and noticed that the 5 Litre container had RED liquid in it and the bit in the bottom of the 1 litre had GREEN... oh for F*$# sake I had been adding an old grow formula from 9 months ago ... so for 6 weeks or so they didn't have the flower nutes that they had been wanting. I'm not 100% sure if that's why the plants were heaps stretchier than what they usually would be in the old system. With my last system it was a perpetual and I would only change it out every 10-14 weeks and everything went fine. flooded 9 times per lights on for 2 minutes, it takes about 5.5 minutes to fill and completely drain. If you only clean your res every 10-14 weeks doesn’t it have the that nutrient film covered at the bottle and won’t that hurt your pump? I love your setup! Clay pebbles is probably my favorite media to use. It involves more work at harvest, but I think it is the best! Sometimes I don't even use the pots. The roots will form 1 solid mat under the pebbles and they think they are in a huge pot. no the H2O2 (hydrogen peroxide) takes care of all that, the res and the whole system stays crystal clear. yep I am thinking of doing it with no pots next round, the reason in having the pots is that when I done perpetual I could pull out the ready plants and not bother the others. i like the convenience of it, the thought of having to change it out fully every week or 2 is why i've been hesitant about keeping a res but you sound like you've got it figured out! usually a rez will last 10 days if you add more nutes at day 5. that's it. after a while you wont even need to check the ph to adjust it. it become routine and is very low maintenance. and yes it is a hell of a lot more work between runs but it saves money and trips to the hydro shop or trying to dispose of whatever other medium. yep I can pretty much add the right amount of nutes and PH down every refill and get it spot-on. @Roux the pots I am and have been using aren't mesh they are just plain square pots, with the ebb and flow the water/nutes flows in and out either way. I do have an air stone in the res to make sure the water keeps oxygen and flow (mixture) going though. Just on the topic of nutrients, I only use the very minimum required ie: when I refill if the EC has gone up I will use less nutes and if it has gone down I will use more. now I have settled on 1.0 EC from start to finish sometimes if there have been very hot days and obviously more perspiration and evaporation my EC will be up to 1.1EC otherwise it will stay pretty stable and I figure if it is stable my plants do not need more..
arrgggggh I will get my drunken arse off the couch and go have a look at the brand name.... it has 'Green Fingers' written on the side but i'm sure I have seen many other tents that look just the same. How often do you flood in hydroton? 9 times in the 12 hour lights on, 2 hourly at night ( lights come on at midnight) then hourly when it is warmer during the day. Right on. 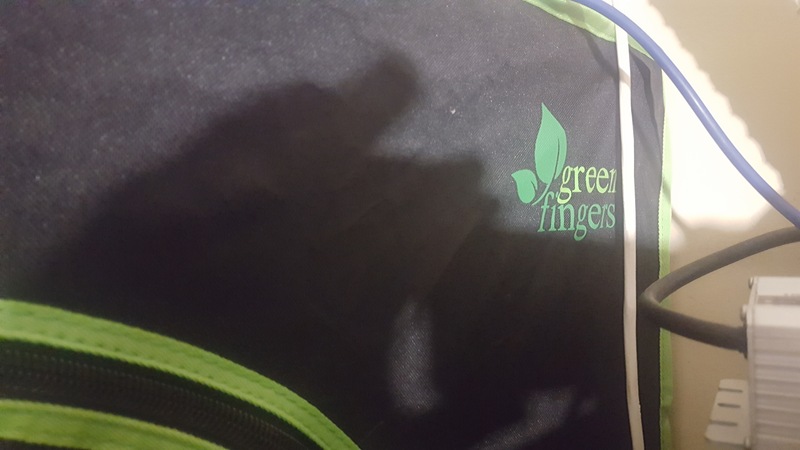 I'm a big fan of my green qube tent. Really excellent quality and like extra features I appreciate.